Hopthru is a streamlined mobile ticketing app for use on public transportation. 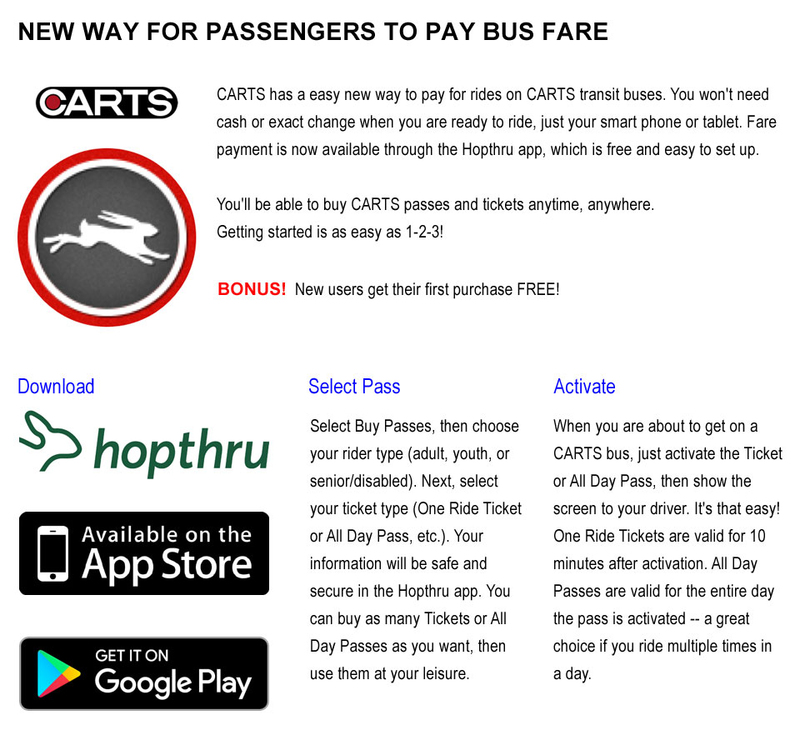 Hopthru and CARTS are working together to offer mobile ticketing. Where can I use Hopthru to buy a All Day Pass or One Ride Ticket? Mobile All Day Passes and One Ride Tickets are available for purchase on the Hopthru app exclusively for use on CARTS, Georgetown GoGeo, and San Marcos THEBus local fixed route services. What type of fare media can be purchased on the Hopthru app? Customers can purchase Adult, Youth or Senior/Disabled All Day Passes and One Ride Tickets through the Hopthru app. No. The Hopthru app is free to download and there are no additional fees for purchasing or using an All Day Pass or One Ride Ticket. Do I need to create a Hopthru account to purchase a ticket or All Day Pass? Yes, you need to download the Hopthru app from the App Store or Google Play store and create an account. What forms of payment can be used to purchase tickets and All Day Passes on the Hopthru app? The Hopthru app will accept Visa, MasterCard, American Express, Discover, JCB, and Diners Club credit and debit cards. Yes, a receipt will be emailed to the email address you have registered with Hopthru immediately after a purchase. Can All Day Passes and One Ride Tickets be bought in advance? Yes, you can buy All Day Passes and One Ride Tickets in advance. Purchase as many as you like and then use them when you want. Where on the Hopthru app can I find my purchased All Day Passes or One Ride Tickets? Purchased All Day Passes and One Ride Tickets will show up in the Tickets screen. When you are ready to get on the bus and activate the ticket an alert will pop up asking if you are sure you want to activate the ticket. How many All Day Passes and One Ride Tickets can I purchase? At this time, you can only purchase one All Day Pass and One Ride Ticket at a time. However, there is no limit to the number of transactions you can make, allowing you to store multiple All Day Passes and One Ride Tickets on your device for activation. Refunds will be handled on a case by case basis. Please visit https://www.hopthru.com/support for assistance. No, you pay the same price using the app as if you paid with cash on the bus..
How do I activate my mobile ticket or All Day Pass? You can access your purchased tickets and All Day Passes in the “Tickets” screen. It is the first screen that comes up when you open the app. There, you will see your tickets and/or All Day passes sorted by purchase date and time (most recent purchase is on top). Simply tap the ticket and/or All Day Pass you would like to activate. You will be prompted to confirm activation. How long will my ticket be active? All Day Passes are valid until 12:01 a.m. the day after activation. One Ride Tickets are valid for 10 minutes after activation. How do I know how much time is left on my ticket? After you have activated your ticket, the expirations date at the bottom of your digital ticket will let you know how much longer your ticket will remain active. When should I activate my mobile All Day Pass or One Ride Ticket? To expedite the boarding process, you should activate your All Day Pass or One Ride Ticket on the Hopthru app before boarding your bus and be ready to display it to the bus driver. An internet connection is only required for purchasing a ticket. It is NOT required to activate it. How do I activate multiple All Day Passes or One Ride Tickets? At this time, each All Day Pass or One Ride Ticket you purchase will show up as an individual item on the Tickets screen. If you wish to activate multiple All Day Passes or One Ride Tickets, simply repeat the process described above for activating an All Day Pass or One Ride Ticket. Yes, Hopthru tracks your location while using the app in order to provide relevant nearby transportation options. Click on the navigation tab, enter a desired location, and see multiple transit options at your fingertips. Lease remember that the mobile tickets and all day passes are only valid on CARTS, GoGeo, and THEBus local service and have no value or transfer privileges on other transit agency services. For help, you can reach the Hopthru support center by going to the Settings screen and tapping Support. You are responsible for ensuring you have a charged and functional phone to activate and display your mobile ticket to the Transit bus operator. CARTS is not responsible for honoring inactive, inaccessible, or expired tickets. If you are unable to display an active ticket, you will have to purchase a fare. What if my ticket or All Day Pass expires before I can use it? If this occurs, you will need to purchase another ticket before your trip. Be sure not to activate a ticket or All Day Pass until you are boarding the bus. Can I use a ticket or All Day Pass on other CARTS or regional services? Mobile tickets and All Day Passes are available for purchase on the Hopthru app exclusively for use on CARTS, Georgetown GoGeo, and San Marcos THEBus bus services. They cannot be used on other regional transit systems (e.g. Capital METRO, Via, The Hop, etc.). * Half fares for registered CARTS customers, seniors 65 and older, persons with disabilities and children under 12. Half-Fares are not applicable on the already discounted Interurban Buses. The San Marcos Municipal Bus Routes offer a Daily, Monthly and Reduced Monthly Passes. MediCare Cards are accepted as proof of eligibilty for half-fare.